British gardening at its best in all aspects. Savill Gardens Scenic Horsedrawn Carriage Rides to sit 4 people comfortably, easy rise steps to the Valley Gardens. Covering over many acres, highlights include the Alpine Meadow, brilliant with rhododendrons in early Summer, the heathers and Autumnal tints. All this together with Glasshouses, Trials and Model Gardens are all features for which Gardens are renowned. Facilities include Restaurant and Cafeteria, The Gift Shop containing the finest collection of horticultural books in the world as well as other gifts and The Plant Centre with many varieties of plant for sale. Magnificent landscaped 35-acre gardens in the Great Park. Spectacular Spring display in the woodland garden; sweeping summer herbaceous borders and formal rose beds; fiery autumn leaf colours; landscaped temperate house. Garden private tours are flexible. 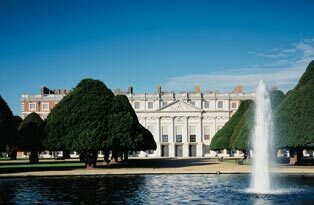 Some gardens can be visited on a half day basis, such as: Hampton Court or Savill Gardens or Kew Gardens. Others, are best visited on a full day basis. Example: Oxford Botanic Gardens, the oldest in England and still a source of inspiration for many gardeners. Began in 1642 and containing a collection of 7,000 different types of plants making this garden the largest in the world. Tour Includes: Luxury air conditioned private vehicle, professional driver-guide and fully escorted throughout. For reservation, Email us sending us your dates of travel and number of people: info@londontourguides.com .